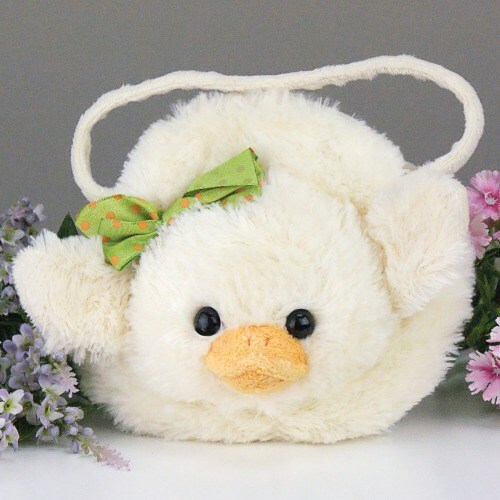 Outfit your sweet little girl with this adorable Plush Duck Zipper Carrysome on Easter or any special occasion. Ducky features a yellow beak, baby safe eyes, and dainty green and pink polka dot bow. She is made from very soft plush fur, has a zipper closure, and is fully lined. A perfect accessory to go with your daughter's adorable outfits. Measures 7" x 7". Additional Details Be sure to also view our Bunny Carrysome as well! For all of your Personalized Easter Plush Animal Gift Ideas, shop 800Bear.com.